Thank you. It's been up for a week and she's itching to add fish and coral (a bounce mushroom, lol). So, we're spending time reading all my old tank threads and learning about how bad I started our Solana, and how I never got the peninsula off the ground. She's beginning to understand that wanting a reef tank is the easy part. Here we go. Location: I'm in the Valley, Dude! I think many "grown ups" would want that tank with those list of supporting parts haha. She's 8. I started my first tank (34G solana) right before she was born. She's always loved the tank and about 2 years ago I got her a small fresh water one. She picked her glo fish and fed and made sure I kept up on keeping it clean. Always helping me with fish selection, water tests, changes. Should would ask if she could get a fish like mine, or a cool coral someone came to trade. I was originally going to just buy one for her bday, but once you start adding up the parts, it was tough to justify the investment. I was able to trade for 90% of her setup and she couldn't be happier. That's awesome. Maybe a future marine biologist? What kind of fish are you going to put in there? She does say she wants to be a science girl and loves science experiments. She wants HER domino clown that we got when she was 1 years old. Her favorite coral in the main tank is the Pink Nepthea and candy cane, but wants zoas that are nicer than mine. pretty sure Cory (mxreefer) put her up to that. 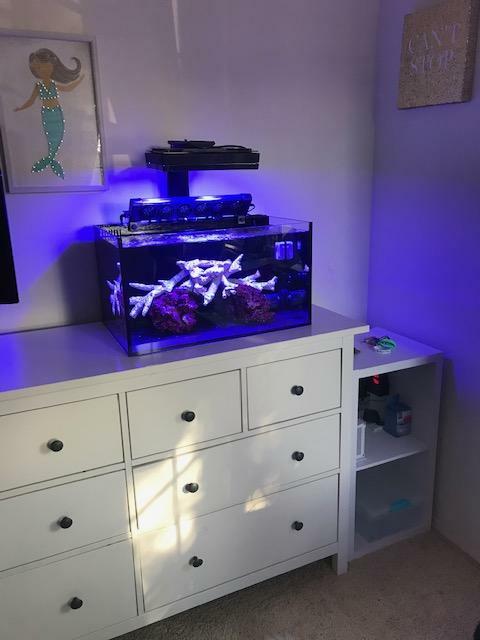 I could tell Kaylee was excited about the tank....I may or may not have told her that she should add a JB mushroom and I definitely didn’t tell her that she could take a bounce mushroom from dad and trade it for a bunch of corals at a swap. She’s lucky to have your support and wisdom to teach her the right way to care for the living things in an aquarium.